Railpictures.ca - Bill McArthur photo, Dan Dell'Unto coll. Photo: A gloomy winter Saturday at the VIA-GO Georgetown Station finds GO Transit single-level Hawker Siddeley cab cars 101 and 106 sitting on the head-end of their consists, plugged in to the wayside power outlets (that provide trains with power and heating while on layover) in the Georgetown commuter compound. Since it’s the weekend, the two won’t see any use until rush-hour commuters swarm the platforms on Monday morning. 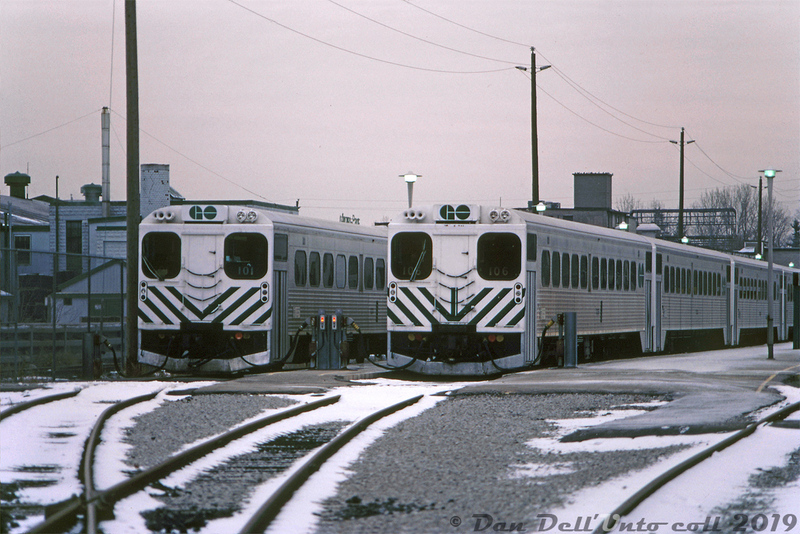 The Hawker Siddeley Canada single-levels were the original equipment designed for and purchased by GO Transit for their initial startup in the mid-60′s. After retirement from GO in the 90′s, 101 & 106 (along with the bulk of the fleet) would go on to second careers in Montreal commuter service as AMT 202 and AMT 106 respectively, earning the nickname “GO Karts”. AMT retired them in 2010, but sister car 104 would be repatriated by GO Transit in 2017 for its 50th anniversary, restored and donated to the TRHA for display at their museum in downtown Toronto. Bill McArthur photo, Dan Dell’Unto collection slide. | Railpictures.ca – Canadian Railway Photography – photographie ferroviaire Canadienne. Copyright Notice: This image ©Bill McArthur photo, Dan Dell'Unto coll. all rights reserved. Caption: A gloomy winter Saturday at the VIA-GO Georgetown Station finds GO Transit single-level Hawker Siddeley cab cars 101 and 106 sitting on the head-end of their consists, plugged in to the wayside power outlets (that provide trains with power and heating while on layover) in the Georgetown commuter compound. Since it's the weekend, the two won't see any use until rush-hour commuters swarm the platforms on Monday morning. The Hawker Siddeley Canada single-levels were the original equipment designed for and purchased by GO Transit for their initial startup in the mid-60's. After retirement from GO in the 90's, 101 & 106 (along with the bulk of the fleet) would go on to second careers in Montreal commuter service as AMT 202 and AMT 106 respectively, earning the nickname "GO Karts". AMT retired them in 2010, but sister car 104 would be repatriated by GO Transit in 2017 for its 50th anniversary, restored and donated to the TRHA for display at their museum in downtown Toronto. Bill McArthur photo, Dan Dell'Unto collection slide.